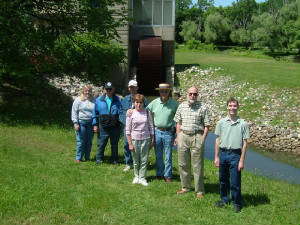 The group in front of the treadmill powered waterwheel. The Piquette Ts kicked off the 2006 tour season right with the Ford Motor Company Village Industries Tour led by Mike Skinner on June 10th. The delegation was small but mighty, including Ts owned by Randy Mason, Peter Nikolajevs and Mike Skinner. Mysteriously, a Dodge began following the group and we kindly allowed them to tag along (just kidding Barry!). The tour began at the Piquette Plant and the group met at Henry Ford Community College at Ann Arbor Trail and Outer Drive to collect the rest of the attendees who had first tour jitters about driving all the way downtown first (you never know how your T is going to react after awakening from its winter slumber!). The first stop was at Nankin Mills where we displayed our Ts for “Ford Day” and answered questions from some of the attendees. We also took the opportunity to check out their museum and listen to some folk music. We then traveled to view other village industries. Located on waterpower sites on small streams within a radius of 50 miles of the immense Ford Rouge plant, these industries were part of Henry Ford’s effort to close the gap between farm and factory. Then something wild happened, Mike Skinner suddenly yelled “LET’S CRASH A WEDDING!! 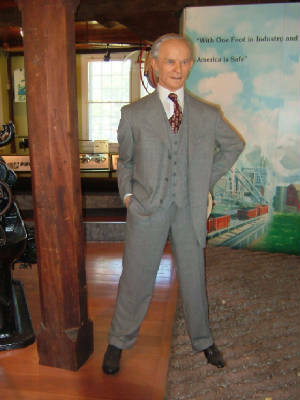 !” Okay, not really but when we went to Mill Race Village we ended up doing just that! Hopefully, the bride won’t be too offended that our smiling faces are in all her wedding photos. We then decided we needed to stretch our legs so we stopped for an aerobics session at the gym located inside the former Northville plant. The group debated if water was actually spinning the water wheel outside of the former plant or if it was being driven by the folks inside running on the treadmills. Our final stop was at the Botsford Inn, formerly owned by Henry Ford. 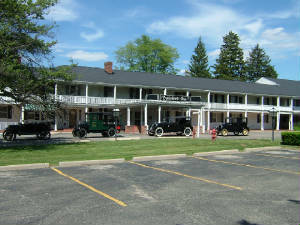 Mr. Ford purchased the inn to appease his wife’s need to kick up her heels and dance. The inn is now closed so the group took a few moments to peer in the windows and even discovered a room that still had a china cabinet filled with silver serving pieces. We ended the tour there eager for the ones to come during the summer months!